Introduction: Mandatory repair of paraesophageal hernias is no longer standard of care with a reported risk of strangulation of 1% per year. Methods of repair vary with regard to surgical approach and technique. 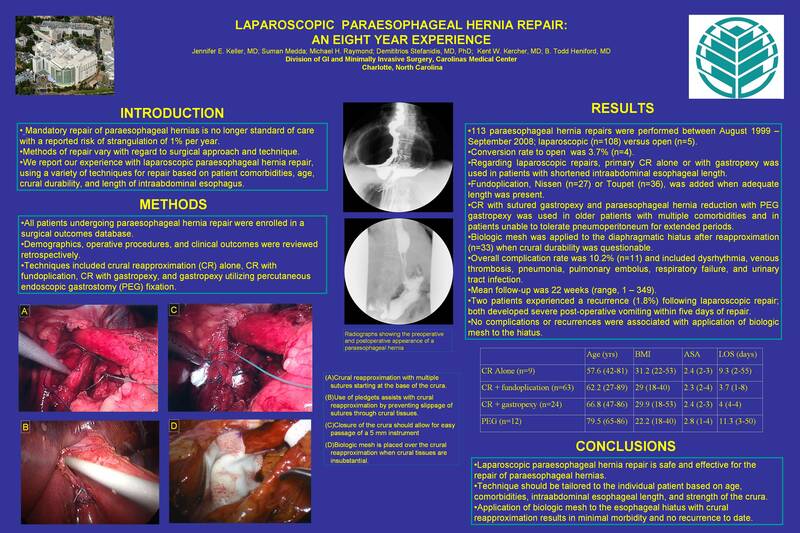 We report our experience with laparoscopic paraesophageal hernia repair, using a variety of techniques for repair based on patient comorbidities, age, crural durability, and length of intraabdominal esophagus. Methods: All patients undergoing paraesophageal hernia repair were enrolled in a surgical outcomes database. Demographics, operative procedures, and clinical outcomes were reviewed retrospectively. Techniques included crural reapproximation alone, CR with fundoplication CR with gastropexy, and gastropexy utilizing percutaneous endoscopic gastrostomy (PEG) fixation. Results: From August 1999 – September 2008, 113 paraesophageal hernia repairs were performed at a single institution; laparoscopic (n=108) versus open (n=5). Conversion rate to open was 3.7% (n=4). Regarding laparoscopic repairs, primary CR alone or with gastropexy was used in patients with shortened intraabdominal esophageal length. Fundoplication, Nissen (n=27) or Toupet (n=36), was added when adequate length was present. CR with sutured gastropexy and paraesophageal hernia reduction with PEG gastropexy was used in older patients with multiple comorbidities and in patients unable to tolerate pneumoperitoneum for extended periods. Biologic mesh was applied to the diaphragmatic hiatus after reapproximation (n=33) when crural durability was questionable. Overall complication rate was 10.2% (n=11) and included dysrhythmia, venous thrombosis, pneumonia, pulmonary embolus, respiratory failure, and urinary tract infection. Mean follow-up was 22 weeks (range, 1 – 349). Two patients experienced a recurrence (1.8%) following laparoscopic repair; both developed severe post-operative vomiting within five days of repair. No complications or recurrences were associated with application of biologic mesh to the hiatus. Conclusions: Laparoscopic paraesophageal hernia repair is safe and effective for the repair of paraesophageal hernias. Technique should be tailored to the individual patient based on age, comorbidities, intraabdominal esophageal length, and strength of the crura. Application of biologic mesh to the esophageal hiatus with crural reapproximation results in minimal morbidity and no recurrence to date.